Will T. Rowe Price Group, Inc. Sink or Swim? Making sense of T. Rowe Price Group's hot start to 2016. Over the past year and five-year periods, asset manager T. Rowe Price Group (NASDAQ:TROW) has trailed the S&P 500 by 5.1% and 35.5%, respectively. 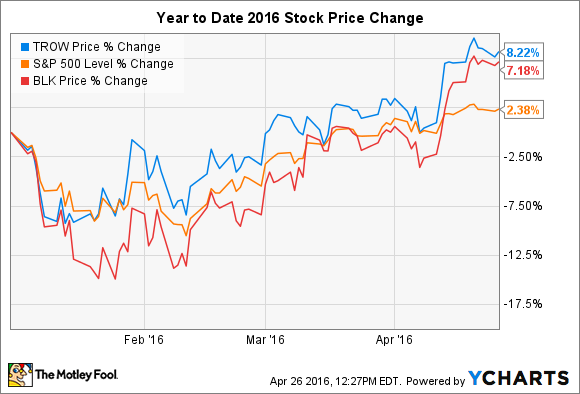 Year-to-date in 2016, however, T. Rowe Price has charged ahead over 9%, crushing the S&P's 2.1% gain. Has T. Rowe Price Group stock turned a meaningful corner thus far in 2016, or are this year's gains a short-term detour on an otherwise underperforming journey? There's only one way to know, and that's to dig right into the numbers. T. Rowe Price has surged over 6.6% over just the past month, representing the majority of the stock's advance so far this year. That jump came in response to the company's first-quarter earnings, which beat Wall Street expectations. T. Rowe reported $1.15 in earnings per share, $0.13 better than expected. T. Rowe's quarter wasn't perfect, however. Most analysts considered the performance to simply be less bad than they had anticipated. Revenues came in at $994 million, shy of the $1.01 billion Wall Street projected. The quarter's earnings per share were 2 pennies higher than in 2015's first quarter, but they landed 2 pennies short of the fourth quarter. The root of the problems was the market volatility and sharp declines seen in the first few weeks of 2016. T. Rowe makes its money by charging fees on the assets it manages for its clients. Market volatility has the dual effect of lowering total assets under management as market values decline as well as spooking investors to the point that they withdrawal their capital and put it in alternative investments. These are major downward forces on the average assets under management at T. Rowe, which in turn lowers the fees the company can charge. T. Rowe Price is not alone in its struggles in the first quarter. BlackRock (NYSE:BLK), for example, missed Wall Street expectations for earnings per share and revenue, coming in $0.04 per share and $100 million short, respectively. Worse yet, BlackRock's net income was down 20% from 2015's first quarter. Again like T. Rowe, the market responded to BlackRock's "not as bad as we thought" earnings by sending the stock higher. The stock is up over 9% just since the company reported first-quarter numbers. To me, this implies the market sees the tough first quarter as a short-term hiccup and favors the stocks over a longer-term and less volatile market environment. This view is supported by strong long-term trends already in place in T. Rowe Price and BlackRock's financials reports. For example, both companies have produced steadily improving profit and operating margins since the financial crisis. 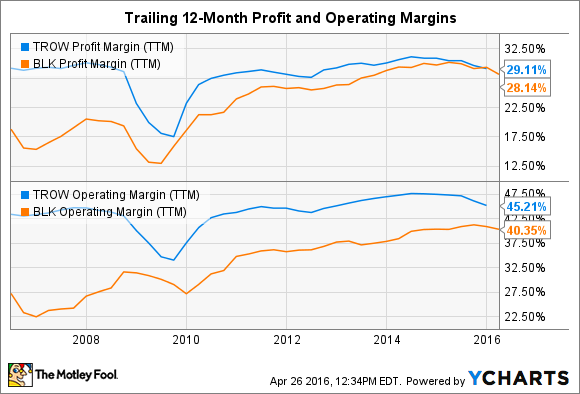 TROW Profit Margin (TTM) data by YCharts. The improved efficiency and profitability over the past five years has also coincided with a 60% and 23% increase in trailing-12-month revenue for T. Rowe and BlackRock, respectively. Net income over the same period, again on a trailing-12-month basis, is likewise up 61% and 33%. The good news keeps coming when reviewing these companies from a capital allocation perspective. T. Rowe currently pays a dividend of $2.08 per share. The company has a history of paying out the occasional special dividends. The most recent example is just last year, when it paid a special dividend of $2 per share, effectively doubling the dividend for the year. On top of that big dividend, T. Rowe also bought back nearly 5% of the company's outstanding shares over the last year. The company reports no debt on its balance sheet, giving it the financial firepower to deliver such shareholder-friendly capital returns. TROW Shares Outstanding data by YCharts. BlackRock's capital policies are impressive in their own right as well. Since issuing new shares in 2009, the company has bought back 14% of shares outstanding while consistently paying out 40%-45% of earnings to shareholders as dividends over the past five years. BlackRock has increased its dividend every year since 2012. 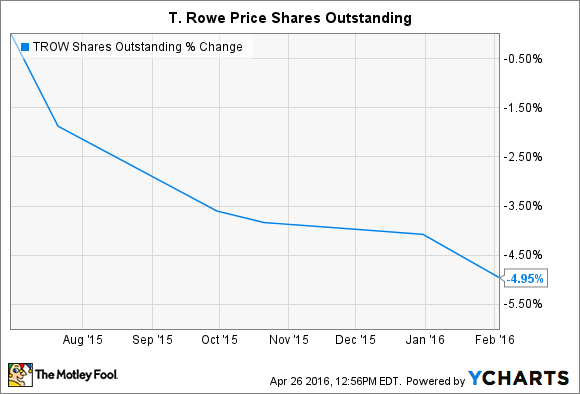 Will T. Rowe Price Group stock sink or swim? The best-case scenario for T. Rowe Price is for the market to continue the steady trend higher that began in mid-February. A calm, rising market will bring higher asset values, new investor capital, and ultimately, higher fees. History has shown that over the long term, this is a reasonable expectation for the broad stock market in general. In the short term, the market seems content with T. Rowe Price and other asset managers focusing on efficiency, investing in growth, and returning big chunks of capital to investors through dividends and share buybacks. Could the market take a turn for the worse, harming T. Rowe, BlackRock, and others? Absolutely. It's impossible to predict short-term market movements with any consistency. However, barring a disruptive change to today's market environment, I think T. Rowe will continue outperforming as it has so far this year.